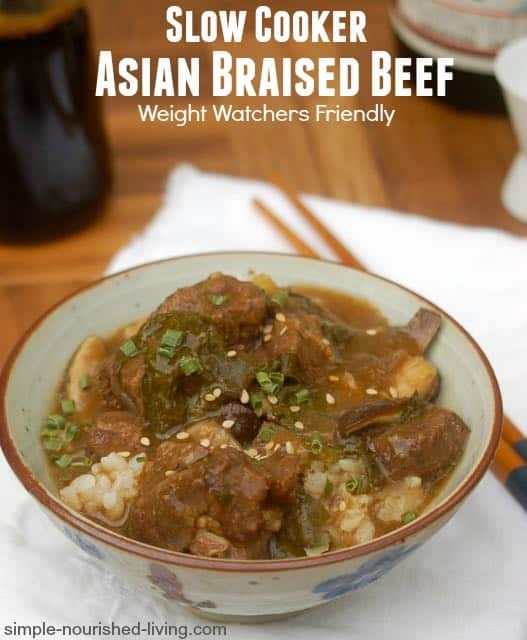 I had a small chuck roast in the fridge and gave Rod 3 recipe options: BBQ beef, Salsa Beef or this Weight Watchers Slow Cooker Asian Braised Beef, which he selected. 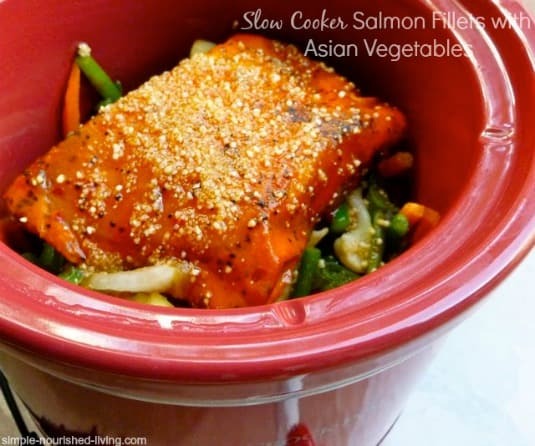 The Recipe is from Slow Cooker: The Best Cookbook Ever with More Than 400 Easy-to-Make Recipes, by Diane Phillips, who once lived in Japan. 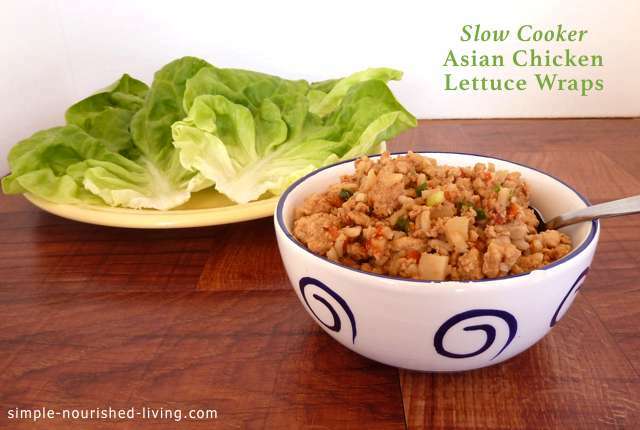 She describes it as a slow cooked variation on Sukiyaki. There’s no browning required, so it’s really easy. But you do need to marinate the meat overnight. 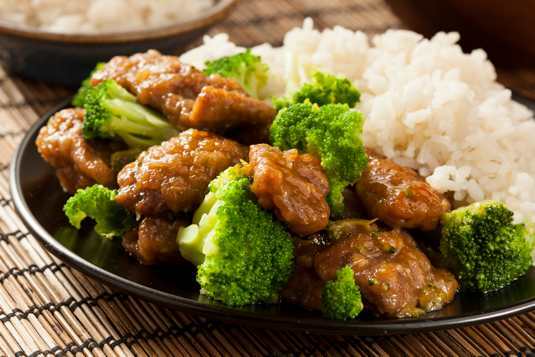 Served with sticky rice to soak up the delicious sauce, this was an easy, healthy and delicious meal in a bowl. The recipe calls for sake, but I think you could substitute additional beef or chicken broth. And she specifies only a shorter cooking time on HIGH, but I think it would also be fine if you cooked it for 6 to 8 hours on LOW. According to my calculations each serving has 310 calories and *8 Weight Watchers PointsPlus, *6 Freestyle SmartPoints. 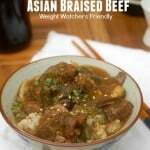 This WW Slow Cooker Asian Beef is an easy healthy delicious variation on sukiyaki with 310 calories (*8 WW PointsPlus, *6 SmartPoints) that the whole family enjoyed. 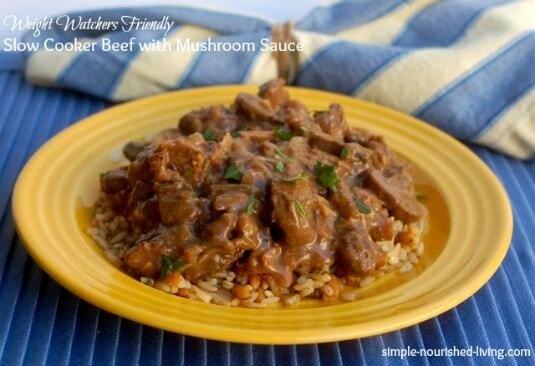 Plan ahead as the beef should marinate at least 8 hours before proceeding with the recipe. Combine the soy sauce, sake, garlic, pepper and sugar in a large bowl with a whisk. Add the meat and stir to coat. Cover and refrigerate for at least 8 hours or up to 36 hours. Put the meat and marinade in the slow cooker. Add the onions and chicken broth and stir to combine. 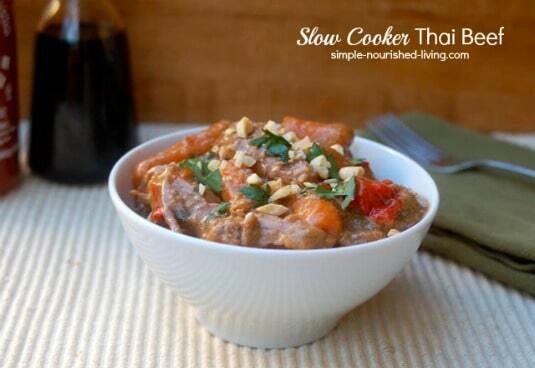 Skim off any fat from the top of the stew. Add the cornstarch mixture. Stir to combine. Add the mushrooms and spinach. The slow cooker will be very full. Cover and cook on LOW for 1 to 2 hours more, or until the meat is tender and the sauce is thickened.